Have you tried using Poster Templates to create stunning Poster Designs for your business? In this post we show you how to use a poster template to create stunning poster designs (without a designer) and give you tips for how you can use them and edit them. This is the first in a series of blog posts about Poster templates and designing posters, where we’ll share future posts around specific poster template themes. 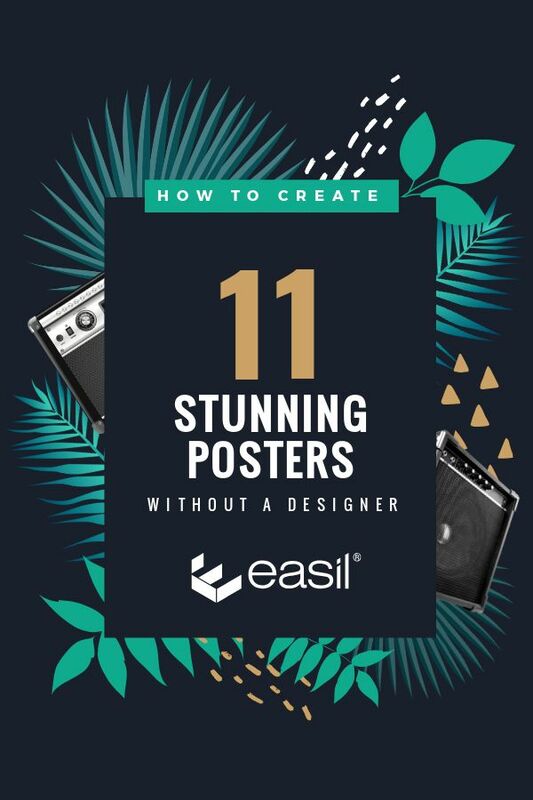 But in this first post, we’re looking at an overview of the different themes or topics for which you might need Poster templates, and how to get started in Easil to create stunning poster designs. Before we jump into each of the poster template designs, let’s take a look at a few tips for editing your poster from Easil templates… without a designer. Key Elements – Don’t change the key elements too much in your poster designs. Stick to the general layout and style that the designer has created with the template. Text – Change the message of the text by all means. But use a text block, phrase or heading that is similar in length to the current design. Fonts – Change up the fonts but stick to the same style. If the heading has a large, bold font, use a similarly large, bold font to replace it. When possible, we suggest uploading your own custom fonts, so you can be sure your end look will be unique. Check out this range of awesome free fonts. Colors – Stick to the same number of colors as the original. Or keep the colors if you love them! Just don’t confuse us by adding more colors than the original template included, or you’ll end up with a technicolor mess! Images – replace the image if you want to use a custom image, but use a similar style of image. If it’s a busy image use a similarly busy image. Does the original image have lots of white space? If so, then use another image with white space. If it’s black and white, consider using black and white. It’s simple, really. If you stick to these guidelines and don’t change too many elements at once, you’ll end up with a professional poster design with all the core design features that formed the original template design. 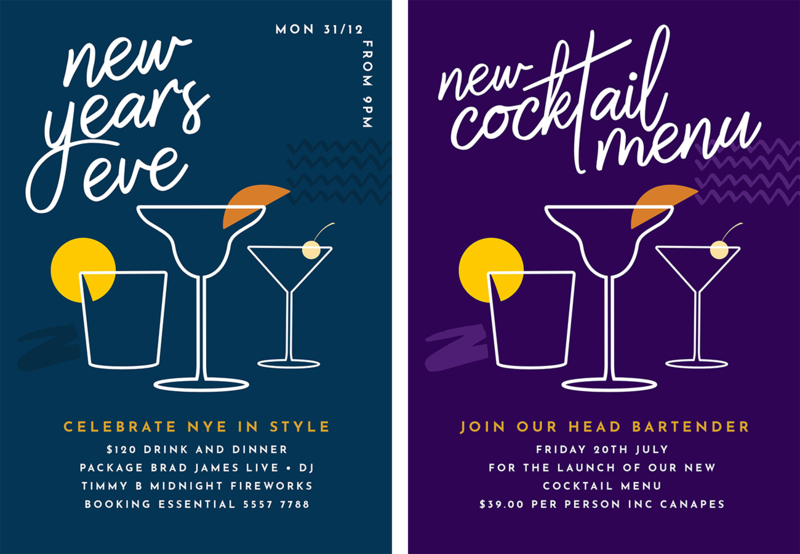 This poster template could be used to create poster designs for other types of Parties and Celebrations, or to promote another beverage related event, like the launch of a cocktail menu. This can be achieved by updating the heading and body copy, and adjusting the colors. Note that we haven’t changed all the features – just a couple of them, taking just a few clicks to create a whole new poster! 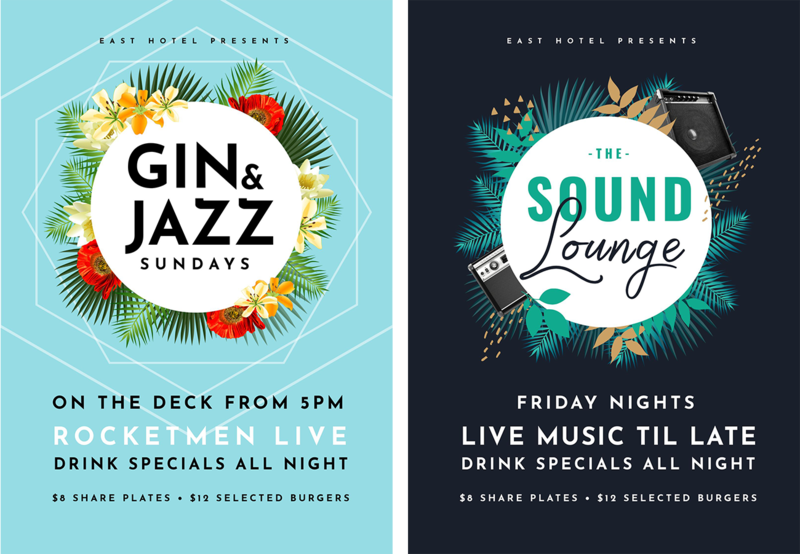 This poster template could be used for other types of music events, or for creating a series of event promotions for a single venue. We got creative here with adding new graphic elements, but remained within the general direction of the template. 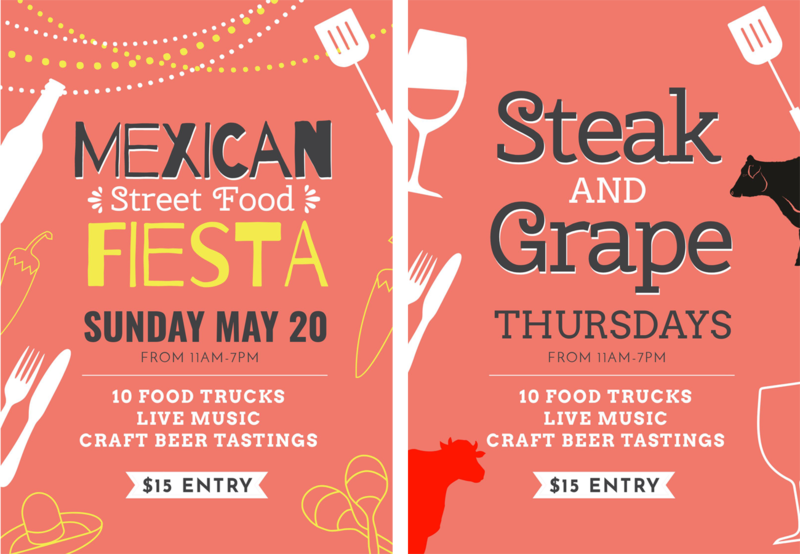 Our creative poster template for Mexican Street Food could be used for other types of food events and promotions, such as a weekly Steak and Wine Night. 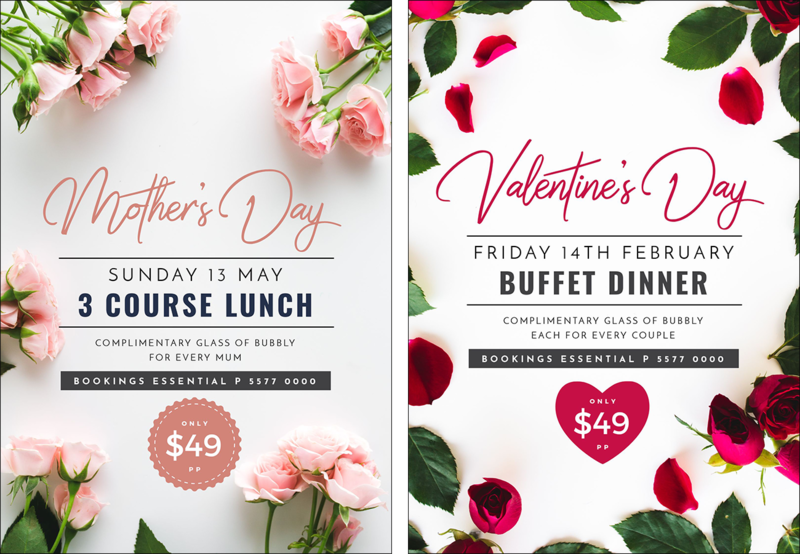 The classic layout of this Mother’s Day Poster template makes it easy to edit for a wide variety of purposes in your poster designs. Here, with just a few tweaks including changing the background image, we’ve created a Valentine’s Day poster (in less than 5 minutes..). 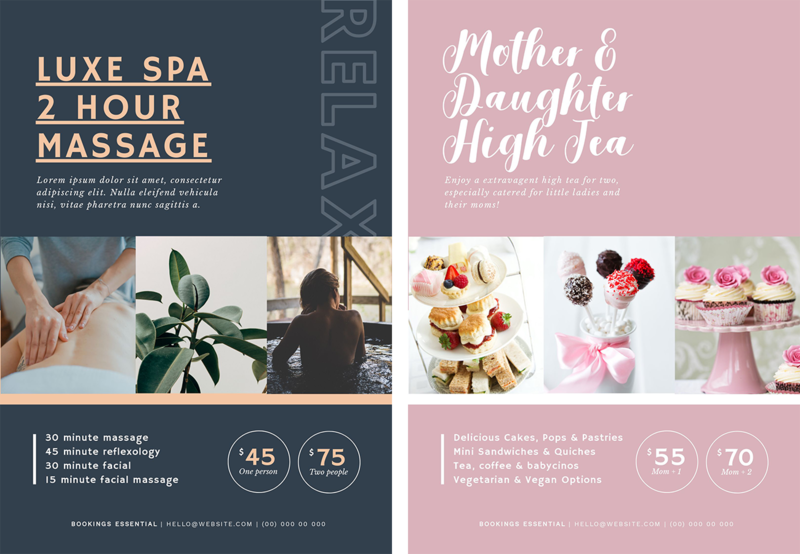 This Day Spa poster template could be used for other types of special offers, such as a promotion for a High Tea, an Accomodation offer, or any other event where you may like to showcase a variety of product photos. On our Mother & Daughter High Tea poster, we changed the font to Salmela (an awesome free font), to give it a unique look. 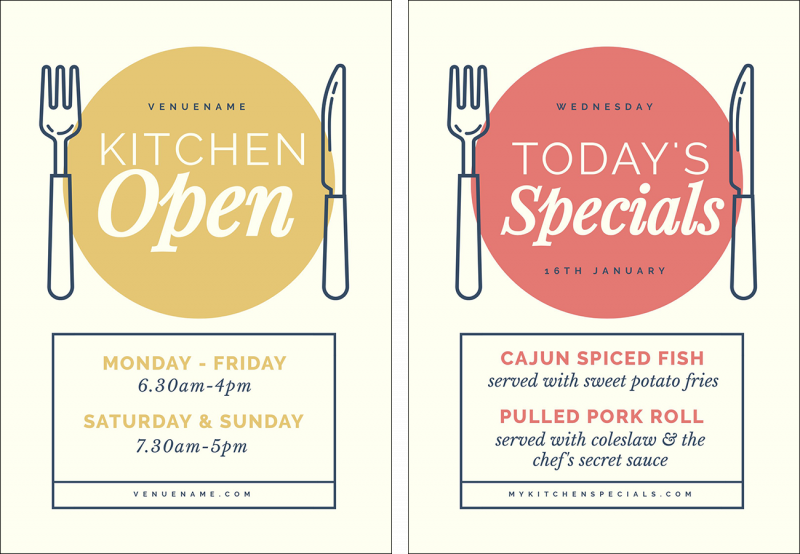 Our Kitchen opening hours poster template could be used for other types of food and drink poster designs or promotions, such as daily Chef’s Specials. 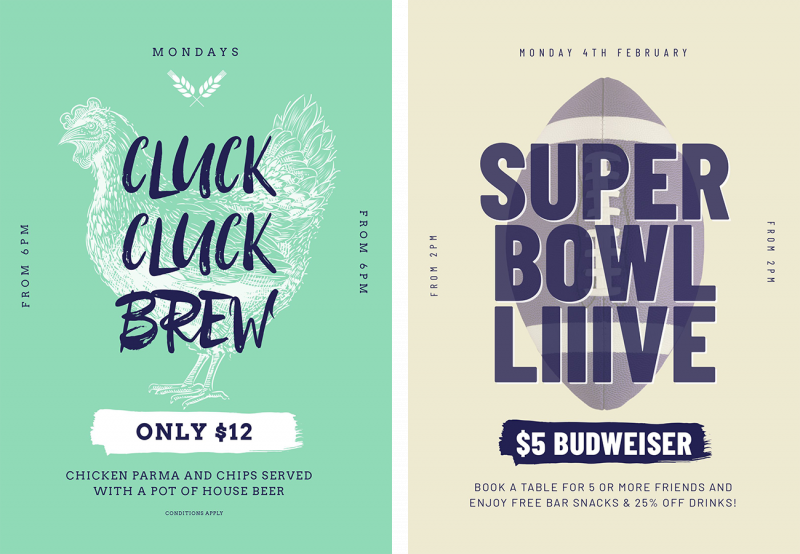 In under 5 minutes you can update the heading and colors to suit your own venue – and save it as a daily specials template that you can print out, and also promote on social media. Think out of the box for your poster designs and choose your templates for suitable layouts, rather than just the subject matter. In this template we took a food promotion poster, and using the base, created a promotion for the SuperBowl. Changed the illustrations to a photo of a football, and applied a filter to it, as well as reducing the opacity of the item. Changed the script font of the heading to a bold font (we used Barlow throughout this design). Updated the colors and background of the various elements. 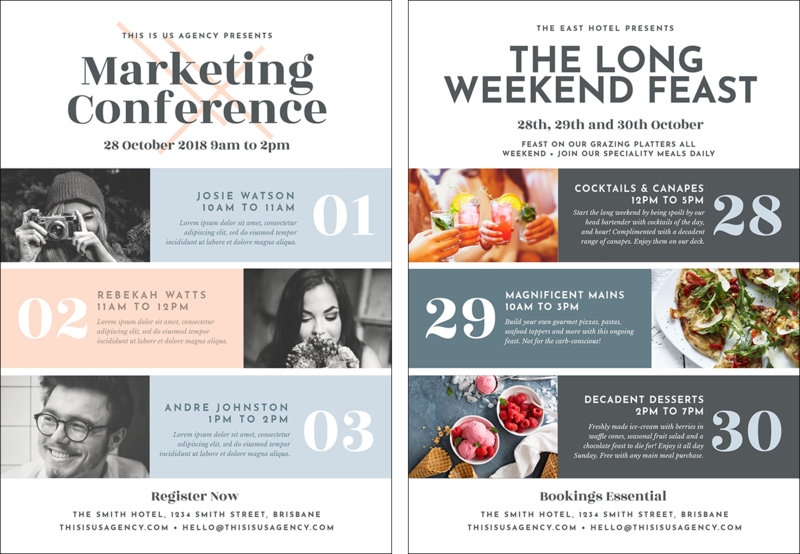 This poster template could be used for other types of event promotions and poster designs, such as this a Weekend Food Festival. Just swap out the images, update some fonts, and you have a professional looking poster in minutes. 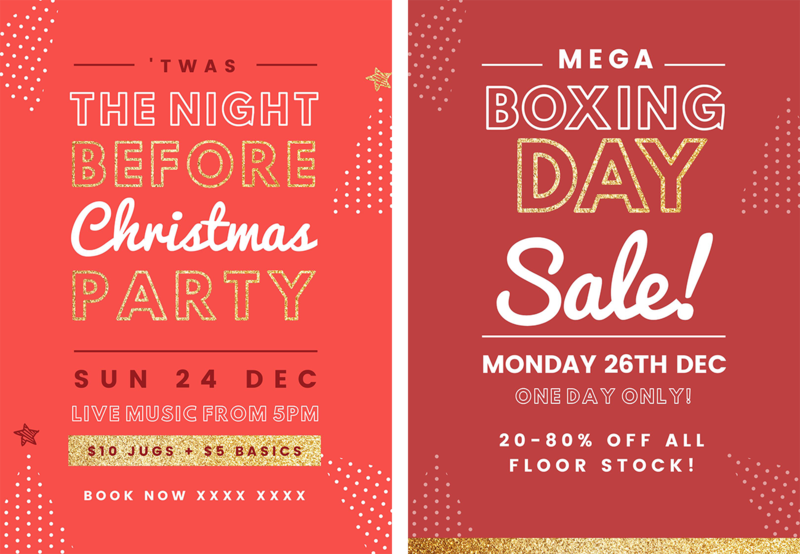 This Christmas Party poster template could be used for the promotion of a sale events such as Boxing Day Sales. Removed the star graphics that represented a Christmas theme. Updated the text, and colors of the fonts and background. Moved the glitter gold element from the date into a bottom frame, by stretching out the size. 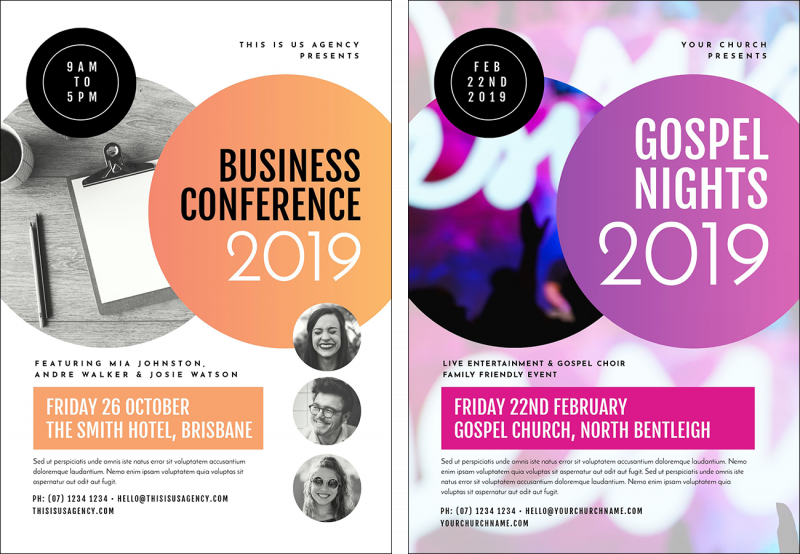 By changing out the main circular image areas, and adding a full size background image, this Business Conference template transforms into a Church Event Poster. You can create many poster designs with this style. As the circular image placeholders were not required, we also extended the area for the date and location to extend across the width of the poster. 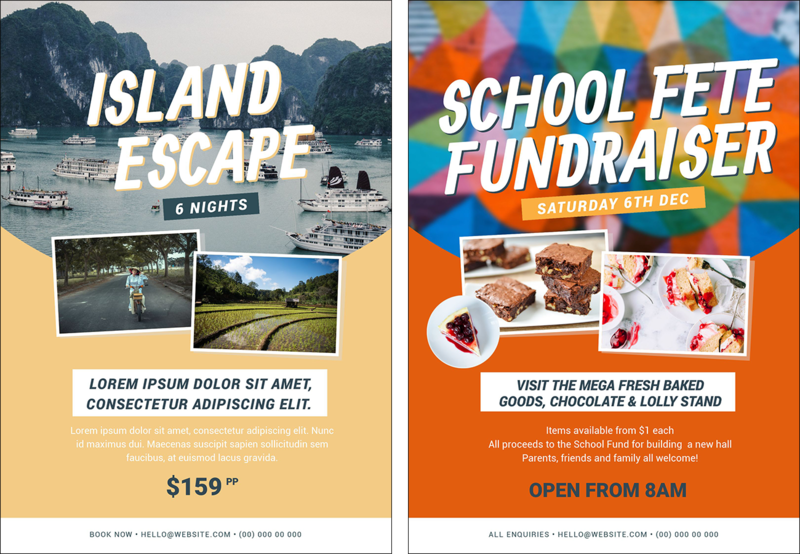 This Island Escape poster template could be used for other types of events or offers, or even for a school fundraising event like the above, simply by switching out the photos and updating the colors. 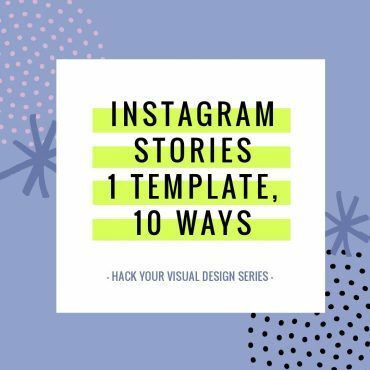 Ready to use poster templates to create awesome posters? Posters no longer need to be a “process” to produce. 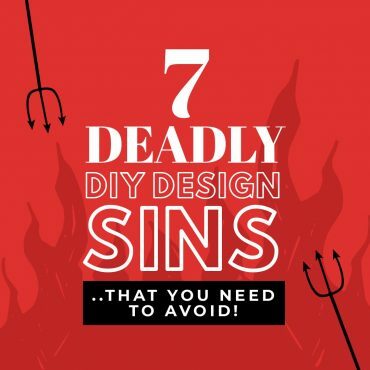 You don’t have to spend hours going back and forth with your designer and enduring frustrating death-by-email. And you also don’t have to accept a design that looks like it’s been created using the same template that every other business is using! Now you have the option to take one of our professionally designed Easil Templates and transform it with just a few clicks and changes. Customize it to suit any event or occasion you wish to create a poster design for! Each of our poster templates are professionally designed and ready to edit the colors, fonts, text, and images. Just remember to follow the guidelines we suggested above, and you’ll be creating awesome posters (without a designer) in no time at all. 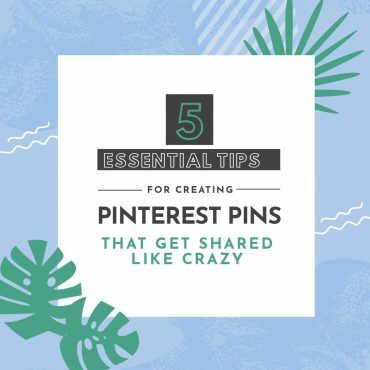 What posters do you need to create in your business and how have you created them previously? Let us know in the comments below.